Pre-order Company of Heroes 2 Steam Key at £26.50 / $41.50 with Instant Delivery! 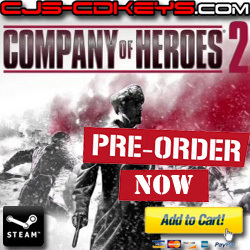 We’re pleased to announce that the Pre-order for company of heroes 2 has now opened. We’re selling our Company of Heroes 2 Steam Key at just £26.50 during the pre-order period, so grab a bargain now! Why buy Company of Heroes 2 from CJS instead of Steam? CJS CD Keys are a great alternative to buying directly on Steam. Rather than pay Steam’s over-inflated £39.99 price, you can get Company of Heroes 2 at just £26.50 when buying at CJS. You still get the exact same service, thanks to the Autokey system. Immediately after payment, you will receive an unused CD Key for Company of Heroes 2 which works on the Steam client. Simply activate your company of heroes 2 key on steam and away you go! The game will begin pre-loading. Once the preload period on Steam has finished, the game will unlock and be ready to play. how does CJS CD Keys offer Company Of Heroes 2 at such a good price? Great question! CJS runs a very unique business model. We buy the games in bulk from EU distributors, and re-sell the keys. Because Retail CD Keys for Company of Heroes 2 function on Steam (They work on the steamworks platform), CJS can simply sell the keys alone, without needing to send the physical box via the mail. This, coupled with our instant key delivery system, means that customers receive unused Steam keys instantly after their payment for all the latest games including Company of Heroes 2! As a result, the end-service is that customers can get the same instant service as Steam, but at a fraction of the cost! Our cheap prices are achieved by buying the games in bulk from distributors. Because we’re taking physical stock, we can sell below the RRP similar to how physical game stores work. We don’t need to sell at the full RRP like Steam. Does the developer get the same cut if I buy from CJS at a discounted price? Yes! It’s common misconception that buying from a CD Key shop means the developer won’t get as much money. This is completely opposite. If you buy a game at £20 from CJS CD Keys and your friend buys the same game at £30 from steam, Steam are the company who pocket the extra cash. The developer gets the same amount of money regardless of who you buy from. To buy your unused Company of Heroes 2 Steam Key and receive it instantly, simply head over to our online store product page and check out! We accept all common payment methods including Paypal!